The Duke and Duchess of Cambridge have joined a select group of people - even more select than the royal family - by being awarded gold Blue Peter badges. William and Kate received the accolade for their campaign work on mental health issues affecting children. "That's very touching," said William on receiving an honour his grandmother was awarded during her Golden Jubilee year. Kate said receiving the badge was "hugely special," and "a real honour." 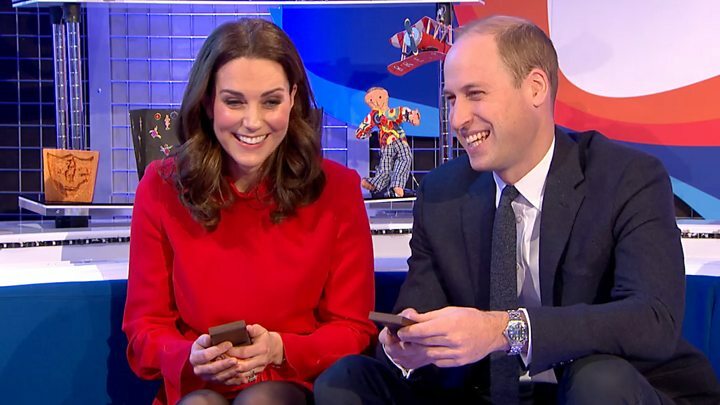 William and Kate will be seen being given their badges in Thursday's Blue Peter Christmas special on CBBC. Sir David Attenborough, JK Rowling, Steven Spielberg and David Beckham are among a small number of people to have been presented with the programme's gold badge. Last year the late Roald Dahl became the first person to receive one posthumously. The special badge is given to role models and public figures who show great expertise in their field and inspire children across generations. Yet it will be superseded next year when the programme introduces a new Diamond badge to mark its 60th anniversary. William said it was "amazing" to get the (literal) badge of honour and promised to compare his with The Queen's. Blue Peter presenters Lindsey Russell and Radzi Chinyanganya had the honour of handing the badges over.